The 2016 USA Judo Senior National Championships got underway at the Irving Convention Center in Irving, Texas on April 9, 2016. This year was a breakout year for Team White Dragon. Thirteen members represented the judo club. Randy Pierce made his coaching debut after a legendary competition stint. Coaching Team White Dragon was head coach Derick Wellman, Eugene Hamilton, Bryan Enlow, and Andrew Lazarz. Byron Helmrich had an extraordinary USA Judo National debut. He teamed up with Amber Jones in the kata competition. The 19 year old showed great promise and poise as the team placed 6th. It was in the shiai category where Helmrich made his biggest splash. The 66kilo brown belt took bronze in a talented division. Jay Baker got off to a good start in his first match but fell short of the medal stand this year. Newcomer Phillip Vojta had an breakout debut in the brown belt 73kg category. 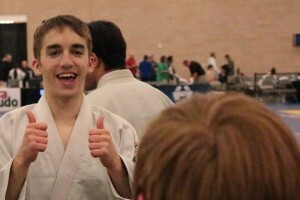 The young judoka took gold with an excellent ippon with less than 30 seconds left in his championship match. The reigning 81kg visually impaired national champion Adnan Gutic had his work cut out for him as he moved up to 90kg and faced the reigning national champion in that weight class. In this champion vs champion clash, Gutic made some good attacks and showed excellent mat defense but his opponent showed good poise and better technique. Gutic lost by yuko and took silver. Anna Feygina got off to a slow start in her first couple of matches but ended the day with two thunderous ippons on her way to a gold medal in the veterans women division. Blair Watts made his return to the US national circuit with a bronze medal finish. 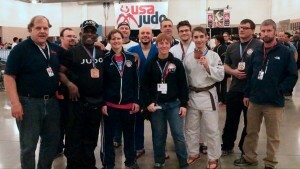 Demonn Smith rounded out the team with bronze medal in the men veterans heavyweight division.